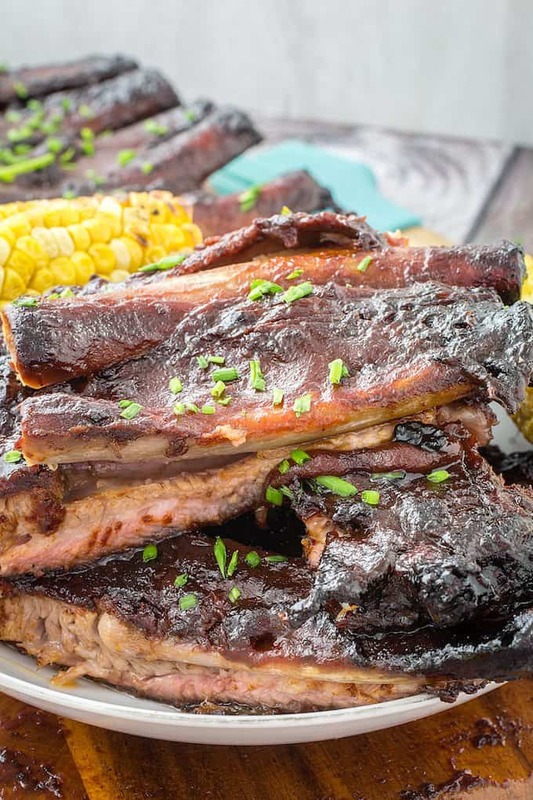 Smoked BBQ Ribs & Tangy Spice Rub is the perfect recipe to pull out at your next big BBQ. It’s tender pork ribs rubbed with seasoning and slowly smoked to perfection until they’re practically falling off the bone. Then you smother them in your favorite BBQ sauce for a finger-licking meal you’ll crave! Check this out for a minute. 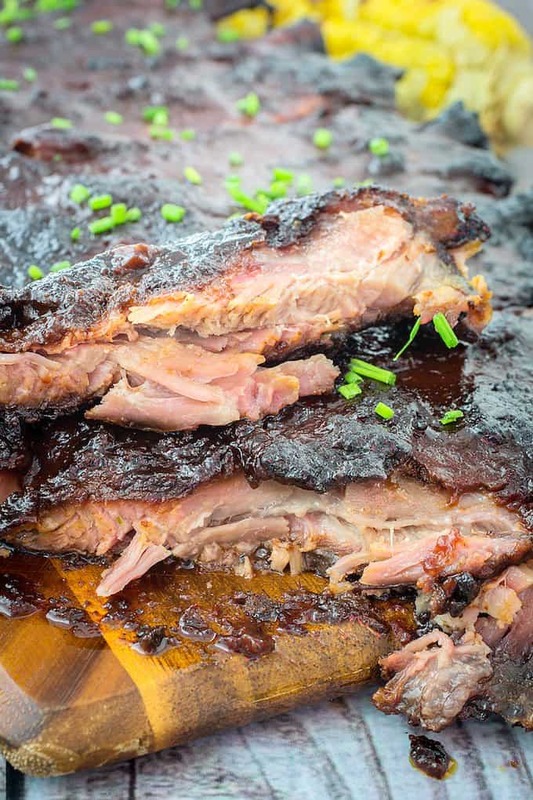 Have you ever seen smoked bbq ribs that were more juicy or tender than that? Because I certainly haven’t. That’s right, we’re entering grilling season here. Which means today, you get something really special. You get Smoked BBQ Ribs & Tangy Spice Rub. As many of you know, it wasn’t too long ago that I made a huge decision in my life. Andrew, myself, and our two cats packed our bags and headed south, all the way down the Florida. And while I may still miss a lot of what New York has to offer (mainly the mozzarella), I have to admit that when it comes to BBQ, Florida knows its stuff. And spring has officially sprung! Which means it’s basically summer down here in Florida. And all of this hot weather has me craving BBQ. The best part is that you can cook it outside, so your oven doesn’t heat up the house! And now that we’ll be moving over to a brand new house and out of this little apartment, I’m finally going to be able to make all of these delicious BBQ recipes in my own home! For this one, I wanted to get some practice in, so I may have commandeered my sister’s insanely awesome charcoal grill. It’s ok, though. There were ribs in return for the rental. And while this recipe sounds a little complicated, take my word for it. It’s really not! I would even venture to say, that it was easy! Every step has about two hours between it, giving you plenty of time to get everything ready. And trust me, the low and slow method is the way to go here. Can we talk about falling-off-the-bone deliciousness for a minute?! I mean, come on. I’m not sure I’ve ever loved anything the way that I loved eating these ribs. And I really love food. A lot. 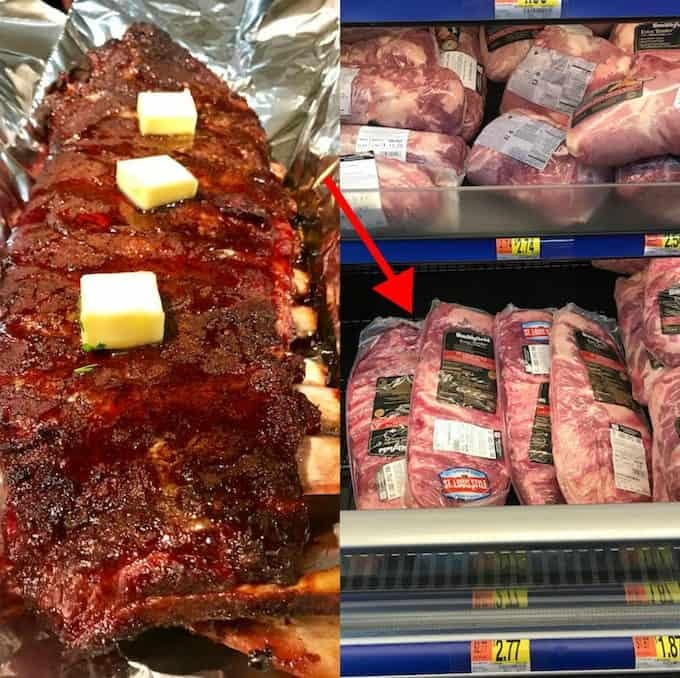 And for this recipe, I picked up my favorite Smithfield Extra Tender St. Louis Ribs from my local Walmart. 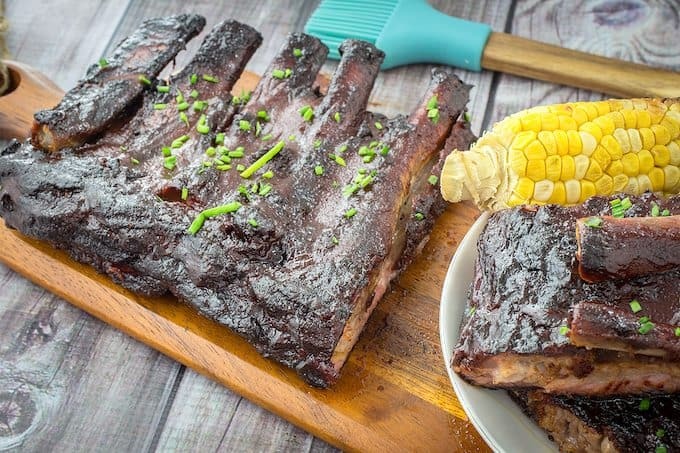 They were serious when they called them extra tender – so don’t worry if this is your first time making ribs! Because they’re still going to be amazing. And the smoking technique we used here just sent them OVER. THE. TOP. Amazing. They also have no added hormones! 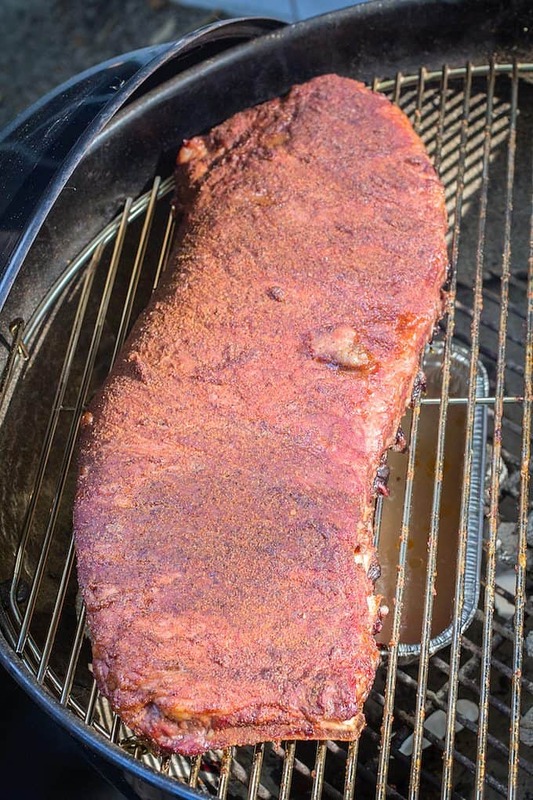 You can get a quick visual in the photo below of the ribs in the tinfoil phase of this recipe. It helps keep the juice and butter together, so the ribs can marinate while they’re cooking. Trust me, don’t ever skip this step, you’ll thank me later. Aaaaaaand back to my BBQ Ribs! Here’s a quick shot of my ribs on the grill. Can you see how underneath the ribs, there’s a little aluminum tray? Like the disposable kind you can pick up at the grocery store, when you’re baking for potlucks? I basically stick one under the ribs so it catches a lot of the juices that fall out, instead of getting the grill covered in something else to clean. Also, take notice on how the coals are off to the OTHER side of the grill. That’s right, we’re going for indirect heating here. I don’t want to see your ribs anywhere close to being over the coals, until we’re down to the last 10 minutes of the entire recipe here. Because at that point it doesn’t matter. And what you end up with? Sticky, tangy, slightly spicy but oh-so-delicious falling off the bone goodness in your hands. 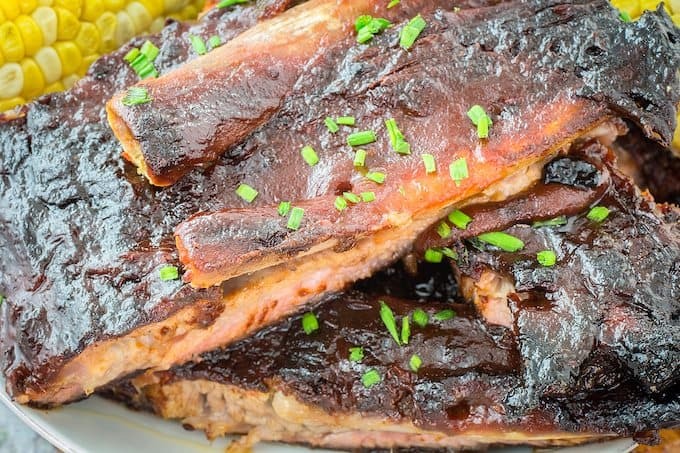 Smoked BBQ Ribs & Tangy Spice Rub is the perfect recipe to pull out at your next big BBQ. 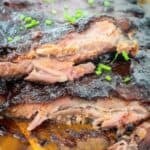 It's tender pork ribs rubbed with seasoning and slowly smoked to perfection until they're practically falling off the bone. Then you smother them in your favorite BBQ sauce for a finger-licking meal you'll crave! In a bowl, mix together spice rub (brown sugar, paprika, salt, pepper, garlic powder, mustard, onion powder, cayenne). Rub mixture on to both sides of ribs evenly. Heat coals in grill chimney, and empty them onto one side of the grill only. Place a small tin (oven safe) on the other side to catch the drippings from the ribs. Place ribs on opposite side of the coals, over the tin. Cover grill and allow to ribs to cook for 2 hours. Then remove ribs from grill and place them on a sheet of aluminum foil, leaving enough foil on the sides to tent the ribs. 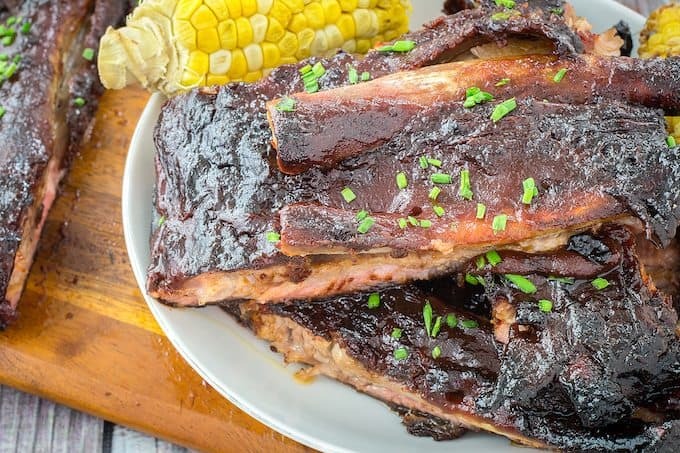 Drizzle ribs with honey and apple cider. Place butter on top of ribs. Close foil and place ribs back onto grill for an additional 2 hours, or until meat starts easily separating from the bone. Remove ribs from foil and place them directly back onto the grill. Cover each side evenly with BBQ sauce, and cook an additional 10 minutes. These ribs are awesome. When I first saw the photo on Twitter I thought it was Salmon, all that gorgeous flaky meat. When I realised it was ribs ooh I fell in love! Pinned for when it’s warm enough to BBQ here in England! BBQ ribs are always the best to eat with your family and best buddies. I wanna try your recipe for the next catch up. Thanks for sharing.